When Bob moved to Oak Manor Senior Living Community eight years ago, he was intentional about getting involved in the community and making friends. He says that is the key to enjoying life and making Oak Manor truly feel like home. Bob started attending Oak Manor’s activities regularly, and now his daily routine wouldn’t be the same without them! He watches the Today Show every morning (something he has done for 15 years), plays his music and reads, visits the Oak Manor Clubhouse at noon for lunch, and then the rest of his day is devoted to engaging in the scheduled activities. “I had never played BINGO in my life, but now I wouldn’t ever miss a game of BINGO here at Oak Manor,” Bob said. He also joins the group for lunch outings, usually at a local spot with a great water view, plays trivia and enjoys a good game of Left Right Center. Having served in the US Navy for four years, Bob initiated a Veteran’s Group, where he and his fellow veterans at Oak Manor go out for dinner together. It wasn’t long after Bob became a regular in the activities that he noticed something was missing. He wanted to add something special to their gatherings, so Bob decided to take up baking. It would be his piece of “home” to bring and share with his new neighbors, or family, as Oak Manor residents like to say. “It makes me feel good that I can give a little bit of my talent and cheer to the group,” he said. He also thought it might make the new residents feel more welcome at their activity gatherings. What better way to welcome a new neighbor than with a fresh baked good? Gathering ingredients is convenient since Bob goes with the group on the Oak Manor bus on weekly shopping trips to Publix. Bob started by whipping up simple cookie recipes. They were a hit! He soon tried his hand at an assortment of breads, and he went through three hand mixers in only four months. He knew it was time to upgrade his equipment, which is why he purchased a KitchenAid Stand Mixer which has been going strong for three years and has sped up his baking tremendously. Bob says he still loves baking cookies, but he has perfected banana nut bread, date nut bread, pumpkin bread, and zucchini bread. During Christmas, he bakes several loaves of fruit cake and yuletide cake, both recipes of his mother’s and are at least 75 years old. Once he started bringing his yuletide cake to share with residents and staff, it became a year-round treat! The Oak Manor Administrator, Denise, says it’s her favorite holiday cake. Sharing baked goods brought Bob much joy, and he is known around the community for sharing the delicious treats with all. In fact, Bob dressed as a professional baker for Halloween and delivered treats to all the residents. It won him first prize in the costume contest! He is even well known at his church for his baking. He brings cakes to group fellowship on Sundays after service, and his homemade breads were recently requested for his church’s annual business meeting. “I feel strongly that I’ll live longer because I’m here at Oak Manor making friends,” Bob said while expressing how important it is to live life with others, and not isolated. 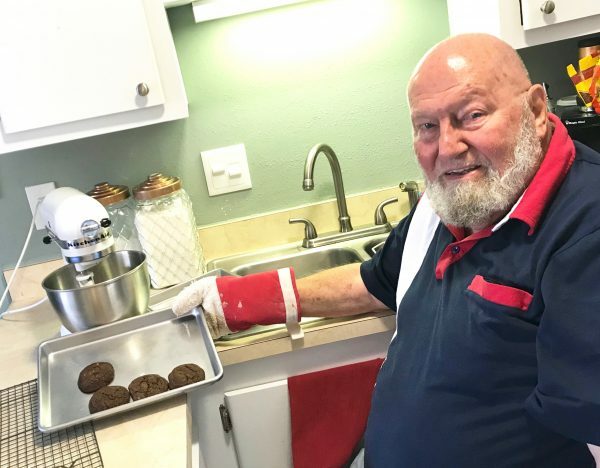 For Bob, friends, activities and baking has helped his senior living community feel more like home.